Ernest R. Mangrum, born Jan. 14, 1921, San Pedro, CA, graduated from San Pedro High School in June 1938. He enlisted in the USN Sept. 12, 1939, in Los Angeles, CA. 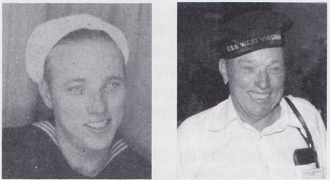 He was sent to San Diego, CA, for recruit training, after which he reported aboard the USS West Virginia for duty. He was assigned to the 5th Div., where he served for about one year before transferring to the aviation unit. Rated AMM3/c in 1941, he was aboard at the time of the Japanese attack. At the sound of abandon ship, he swam to Ford Island and became part of a scouting squadron, flying anti-sub patrols off of Oahu. Had duty with various scouting squadrons and carrier aircraft service units during the war. Rated chief aviation machinist mate in 1945. He was stationed on Eniwetok at the close of the war. He remained in the service and did tours of duty at NAS San Diego, Air Transport Sqdn. 8; Utility Sqdn. 3; Guided Missile Unit Six Point, Mugu, CA; Patrol Sqdn. 6, Barbers Point; Naval Air Facility, Naval Ordnance Test Station, China Lake, CA; and was maintenance chief at the facility until his transfer to the Fleet Reserve on Sept. 12. He remained, and still lives, at China Lake, where he worked as a machinist and tool maker until his retirement in October 1976. His awards include the Good Conduct Medal, American Defense w/Fleet Clasp, American Theater Campaign, Asiatic-Pacific Campaign, National Defense, WWII Victory, Navy Occupation Service w/Berlin Airlift Device and the Presidential Unit Citation. He is a life member of the Pearl Harbor Survivor's Assoc., VFW, Masonic Lodge; a member of the American Legion, Fleet Reserve Assoc., BPO Elks, USS West Virginia Reunion Assoc. and El Bekal Shrine Temple. He enjoys hunting, fishing and traveling.